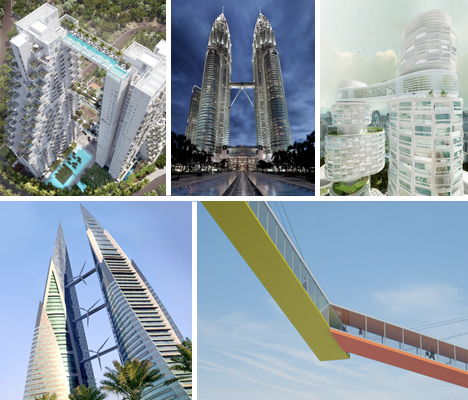 Soaring above the city streets, spanning towering skyscrapers or simply providing links between buildings at lower heights, skybridges often host gardens, observation decks and even swimming pools. More than just indoor bridges, they’re spaces from which to take in views of cities around the world, from Singapore to Copenhagen. 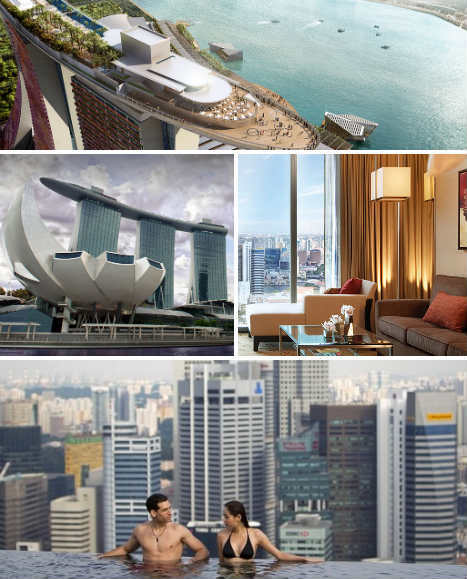 Over 650 feet above the streets, a sky park stretches between the towers of the Marina Bay Sands Hotel in Singapore, offering one of the world’s most spectacular infinity pools, which seems to pour over into the cityscape. 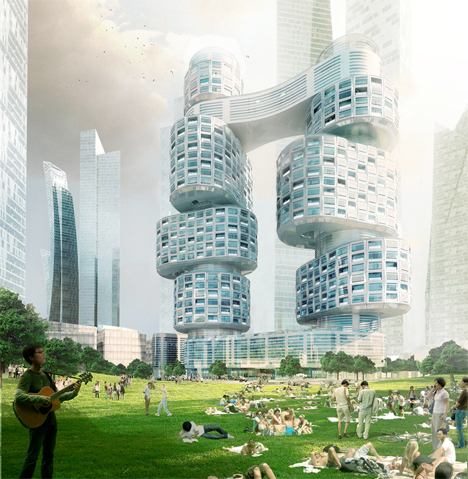 The two-acre skylark also includes a garden, jogging paths, spas and ‘floating’ crystal pavilions. 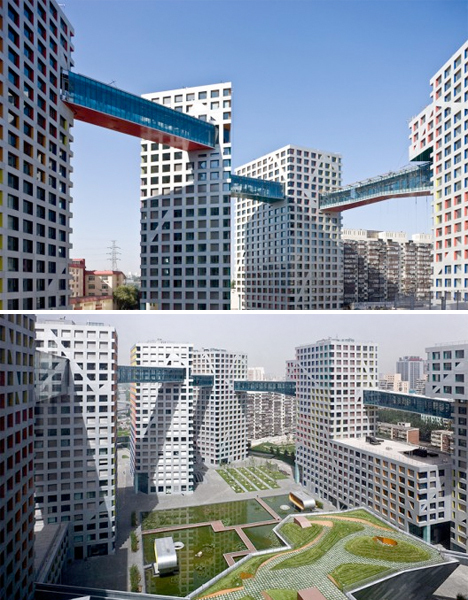 It’s cantilevered 230 feet at one end, twice the length of a Boeing 747 jumbo jet. 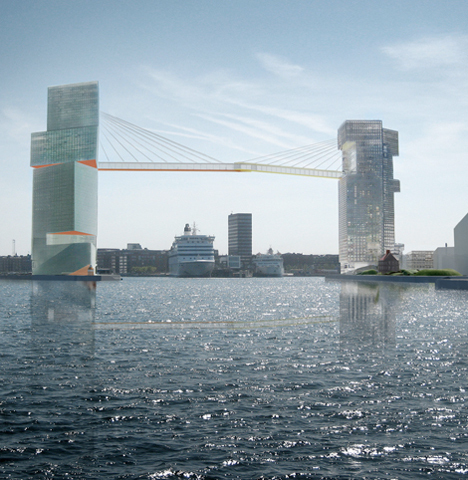 Designed as a gateway to the city of Copenhagen, Steven Holl’s Harbor LM project features a skybridge between two skyscrapers hovering over the water. 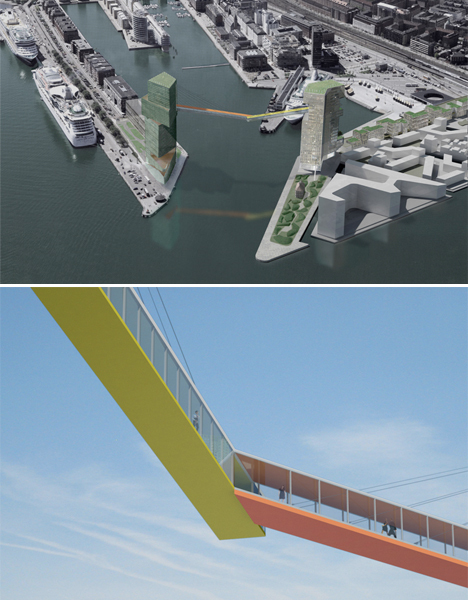 The skybridge features prow-like public deck looking out onto the harbor, painted in bright orange and yellow to reflect off the surface of the water at night. 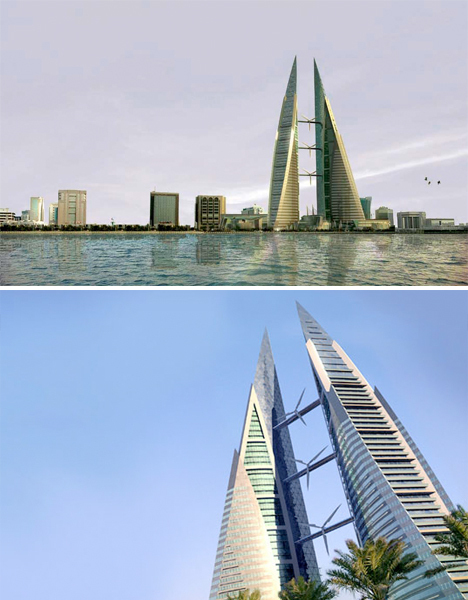 Three skybridges studded with wind turbines connect the two towers of the Bahrain World Trade Center, a 50-floor complex soaring 787 feet into the air. The turbines provide 11%-15% of the towers’ total power consumption, and operate 50% of the time on an average day. 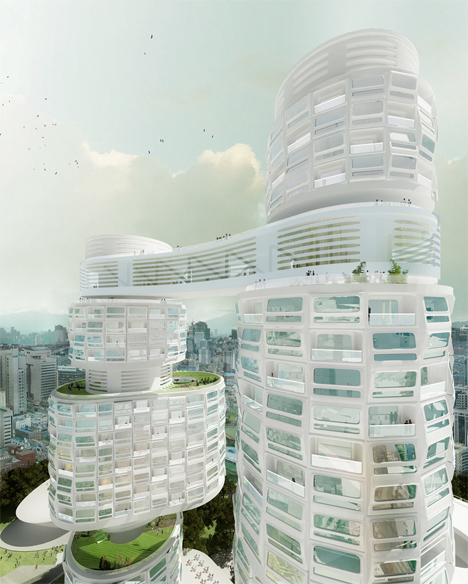 Two skyscrapers made up of stacked and rotated volumes are connected near the apex by a 30-story-high skybridge in this project in Seoul, Korea by New York-based Asymptote Architecture. The Velo Tower skybridge includes both a protected indoor viewing platform connecting the towers, and an outdoor recreation spot with gardens and fountains.